To keep your clothes and other items; the bedroom armoires are used at many places. Many of these can fit in small bedroom space. Revere Armoire by Andover Mills is a practical solution to all your storage problems. This lovely armoire features a spacious two door cabinet with three interior shelves. The shelves are adjustable and helps you to customize this armoire according to your requirement. 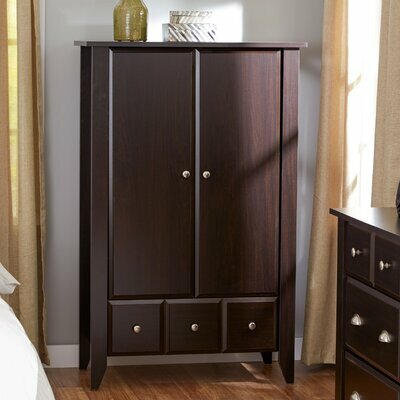 With its neutral finish, this armoire will fit in seamlessly with any bedroom décor. Made out of manufactured wood in USA. This lovely armoire is also available in Jamocha Wood finish. Includes two interior shelves and one exterior drawer. Design of the handle: Knobs in brushed metal finish. Tapered legs support the armoire. Easy to assemble with the help of a screwdriver and hammer. 5 year limited product warranty provided by Andover Mills. 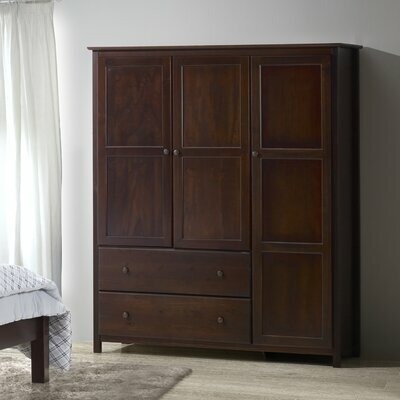 Enhance the charm of your room with this gorgeous Truman Armoire. Engineered from manufactured wood, this sturdy armoire will endure the wear and tear of many years to come. This stylish armoire is available in two beautiful finishes that include, Distressed Antiqued White finish and Distressed Antiqued Paint finish. The gorgeous Truman Armoire features one cabinet with two doors, storage cubby holes, a garment hanging rod and two exterior drawers to provide ample storage space for your all clothing items and other essentials. Turned feet and solid wood knobs in antique white finish add elegant detailing to its overall look. Use of non-toxic materials in construction of this armoire makes it safe to be used at homes with kids and pets. A product of USA with excellent quality. 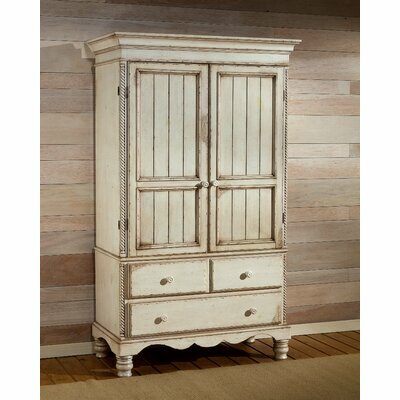 The beautiful armoire is also available in Distressed Antiqued Paint. One spacious cabinet with two stylish doors. Cubby holes behind the cabinet doors. Comes with a garment hanging rod. Includes two generous drawers that run on metal glides and contain safety stops. Design of the handle: Solid wood knobs in antique white finish. Can hold TV set weighing up to 95 lbs. Maximum weight capacity for the cabinet: 95 lbs. Maximum weight capacity for the clothing rod: 40 lbs. Easy to assemble with the help of hammer and Philips head screwdriver. Sauder provides 5 year limited warranty. The stylish and classy Sauder HomePlus Wardrobe Cabinet adds a twist to conventional storage cupboards. Designed intelligently to merge seamlessly with both contemporary and modern bedroom decors, this wardrobe cabinet is a perfect blend of functionality and style. Engineered wood construction renders sturdiness and endurance to this wardrobe cabinet. Solid and strong base ensures that it remains stable and firm on the floor and does not tip over. Bar pulls make opening and closing of the cabinet doors easy and convenient. Thanks to the garment rod, you can hang up your suits, gowns, dresses and blazers neatly. It comes with adjustable shelves that allow storage of small to large items as per your requirement. You can keep your briefcase, handbags or other valuables in the bottom compartment. You can place HomePlus Wardrobe Cabinet in any room of your house including your kid’s bedroom or guest room. This charming wardrobe cabinet will retain its original look and sheen as long as it is maintained occasionally by wiping it with a soft dry cloth. Constructed from engineered wood in United States of America. Also comes in Sienna Oak color. Drawers and clothing rod included. Drawers have T-lock and metal glides with safety latches. Design of the handle: Bar pulls. Comes with adjustable base levelers. There is cord access in the enclosed back panel. Maximum weight limit of the shelf that is above the drawer: 50 lbs. Place this armoire against a wall. Sauder provides 5 year limited product warranty. Give transitional style to your contemporary bedroom décor with the lovely South Shore Acapella Wardrobe Armoire featuring framed doors and streamlined drawers accented with nickel finish bar pulls. 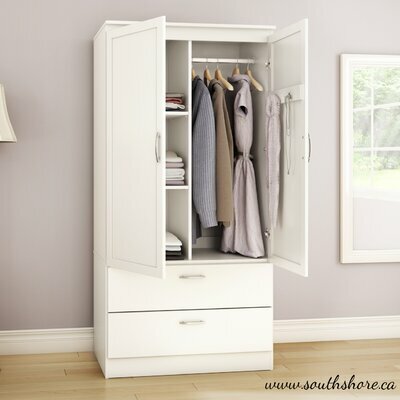 The Acapella Wardrobe Armoire by South Shore will prove to be an excellent solution to your storage problems. It includes two separate cabinets with two doors. The right side is divided by two adjustable shelves into three storage compartments. The left side has a sturdy metal rod for hanging your dresses, gowns, coats and blazers. There are also two hooks on the back side of the door for hanging handbags and clothes. Constructed from FSC certified, EPP compliant and eco-friendly manufactured wood. Also comes in two more attractive finishes: Black and Chocolate. This armoire is divided in two halves vertically. Right side cabinet comes with a garment rod for hanging your clothes. Clothing rod is made of metal. Left side cabinet has three storage spaces separated by two adjustable interior shelves. Drawers have metal runners for a smooth gliding. Drawer bottoms are new and improved as they are made from wood fibers. Safety bracket ensures the wardrobe does not tip over. Maximum weight limit of the cabinet is 85 lbs. Easy to assemble. Tools required are hammer and screwdriver. South Shore provides 5 year limited warranty. Bring romantic charm to your home with this attractive South Shore Huntington Armoire featuring natural finish. 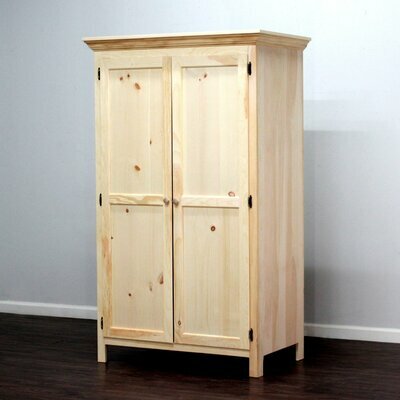 Made out of non-toxic, eco-friendly, EPP compliant and FSC certified manufactured wood, this country style armoire flaunts a beautiful country pine finish. Stylish kick plate and elegantly designed metal handles in antique pewter finish compliment the overall look of this gorgeous armoire. The stunning Huntington Armoire features two generous drawers with polymer glides and safety latches. The cabinets have two adjustable shelves that divide the cabinet into three spacious storage areas where you can keep your bulky items like spare pillows and blankets. Matching bed, dresser and nightstand available so can complete the matching bedroom set with style. Made in Canada out of eco-friendly, EPP-compliant sturdy manufactured wood and laminated particle board carrying the Forest Stewardship Council (FSC) certification. Country style kick plate for stylish look. The cabinet is wide enough to fit adult size hangers. Comes with profiles top and drawers. Adjustable shelves separate cabinet into three storage spaces. Two practical drawers provide sufficient storage space. Design of the handle: Metal handles in an antique pewter finish. Polymer glides with safety stops and dampers ensure smooth operation. This wardrobe armoire requires assembly by two adults. The back of the armoire is not laminated. Shipped in one box for your convenience. ISTA 3A certified to reduce chances of damage during transit. 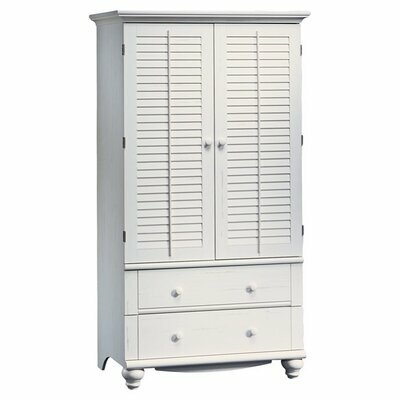 South Shore provides 5 year limited product warranty on this armoire. Give a refined touch with style to your bedroom with this stylish Shaker Armoire by Grain Wood Furniture. The modernized traditional style of Shaker Armoire will create a timeless interior décor in your home while providing ample space for storage. Two spacious drawers are 8.25 inches deep and provide sufficient space for keeping your essentials. Three door cabinets include a garment hanging rod, one large adjustable shelf and three small adjustable shelves where you can keep your clothes or bulky items like blankets. Metal knobs in aged copper finish accent the cabinet door and drawer fronts. Eco-friendly construction from 100% solid pine wood obtained from renewable forests. Also available in elegant Espresso finish. Includes 3 door cabinets with 1 hanging rod, 1 large adjustable shelf, 3 small adjustable shelves and 2 exterior generous drawers. Solid wood drawers run smoothly on metal glides. Design of the handle: Metal knobs in aged copper finish. 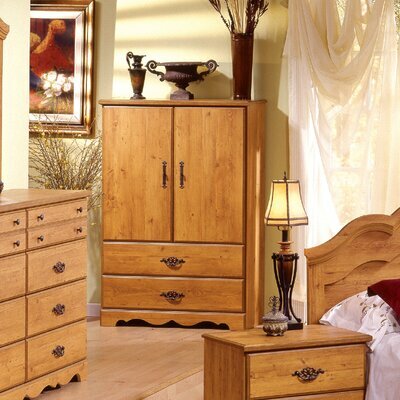 Make a complete set with Matching chest, dresser and nightstands. The graceful Wade Panel Door Armoire provides practical solution to your storage problems. This rustic style armoire features a huge compartment with metal rod where you can hang your garments. A fixed shelf above the hanging rod provides additional space for storing your belongings. Tapered legs, crown molding top and wood paneling on the door fronts accentuate the overall look of this elegant yet stylish armoire. Wade Panel Door Armoire Collection. Manufactured in United States out of pine wood. Finish of this armoire: Unfinished. This attractive wardrobe armoire also comes in Antique Cherry, Colonial Maple, Espresso and Natural Teak finish. Features a crown molding top. Includes one fixed shelf that provide additional storage space. Design of the handle: Round wooden knobs. Sturdy and stylish tapered legs. No need to put it together as this wardrobe comes assembled. Adorn the elegance of your bedroom with the sophisticated look of this gorgeous Halton Armoire. This graceful armoire is an amazing blend of country styling accentuated with cottage details. You will fall in love with the quality and excellent craftsmanship of this armoire. Beautiful crown molding top, turned feet and antique white finish will exude a glowing charm around your bedroom interior. Halton Armoire provides sufficient storage space with its two cabinets and total three drawers. One large and two small drawers operate smoothly on wooden glides. Cabinets have adjustable shelves that not only gives ample storage space but also allow you to adjust according to your need. Manufactured from solid pine wood. English dovetail joinery for structural integrity. Double cabinets with large doors. Doors are double hinged and opens easily up to 270°. 2 adjustable shelves for additional storage space. 3 spacious drawers, 1 large and 2 small. Drawers run smoothly on wooden glides. Sides of the drawers are thick. Drawer bottom features tongue and groove joinery. Easy to assemble as it requires minimal assembly. Product care: Use a clean or specially treated dusting cloth that attracts and hold dust particles. Avoid using abrasive cleaners or any liquid as they may harm the finish of this armoire. With graceful poise and pleasing looks, the Hazelton Armoire will be an excellent addition to your bedroom décor. Manufactured from hardwood and veneers, this attractive armoire sports a timeless beauty with functionality. With four deep drawers and a two door cabinet, this armoire provides ample storage space where you can keep all your necessities in an organized fashion. The spacious cabinet features an adjustable shelf. The flawless Hazelton Armoire is ISTA 3A certified and will remain safe during the transit. This is a wardrobe armoire that can also be used as TV armoire. Constructed in United States from hardwood and veneers. Both dovetail joinery and tongue and groove joinery for structural integrity. Also comes in charming Cherry finish. Includes a two door cabinet and 4 spacious drawers. Design of the handle: Matching knobs. Maximum weight limit for the cabinet: 100 lbs. 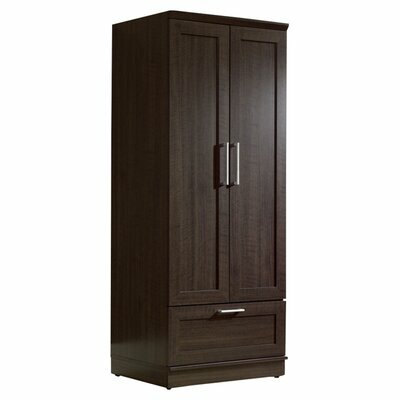 Manufacturer provides one year limited warranty on this armoire. Inspired by British Colonial and Campaign styling, the marvelous Kingstown Trafalgar Armoire by Tommy Bahama will take your breath away. 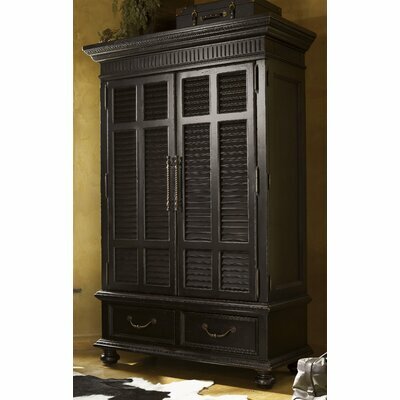 This classy armoire flaunts a rich look with distressed and tarnished black finish. Louvered cabinet doors, turned feet and custom designed drawer pulls in aged bronze finish and copper undertones adorn the overall glamour of this lovely cabinet. This graceful armoire provides ample space for storing all your necessities. Two huge cabinets with two interior drawers allow you to keep your valuables and other knick-knacks safe and organized. Two exterior drawers also provide additional storage space. In short, this timeless beauty guarantees you a practical solution with a distinctive design and sense of well-travelled life. Can be used both as wardrobe armoire and TV armoire. Constructed from mahonie solids, American maple and mahonie veneers. 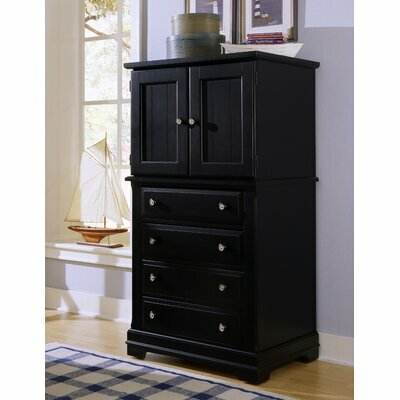 This armoire has distressed and tarnished black finish. 4 interior drawers and 2 exterior drawers. Drawers operate smoothly on wood runners and glides with safety stops. 2 cabinets with separate doors. Louvered doors are wraparound and when opened reveal sufficient storage space for clothing items and media. Design of the handle: Custom designed drawer pulls made of solid brass with aged bronze finish and copper undertones.